Published on Tuesday, November 11, 2014. 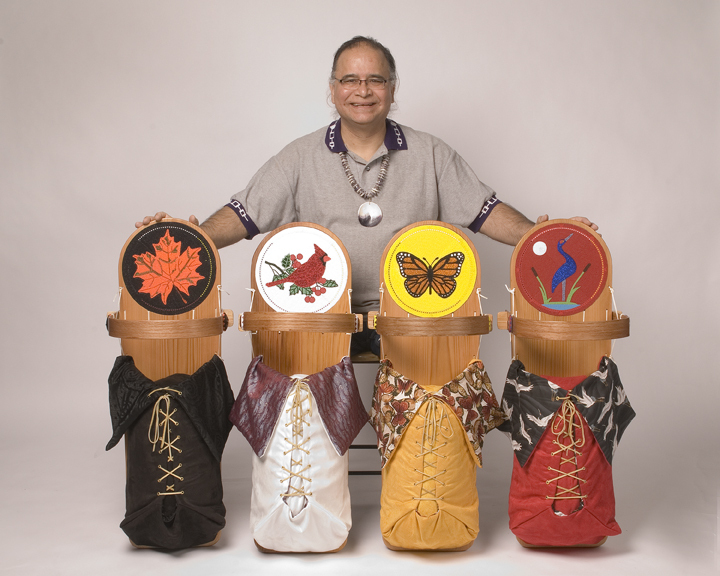 Douglas K. Limon with handmade cradleboards featuring his distinctive beadwork. For the last several years November has been named Native American Heritage month. The American Craft Council is proud to participate in recognizing Native American culture by dedicating this month's salon, "Crafting the Spirit," to Native American art. We invited local Native American artist Douglas K. Limon and the new assistant curator of Native American art at the Minneapolis Institute of Arts, Jill Ahlberg Yohe, to partake in a discussion about the practice and presentation of Native American craft. I was able to catch up with both of them for this pre-event interview. Please join us on Wednesday, November 12, for the full conversation. Native American art has always seemed to have closer ties than most art to the cultural beliefs of its people. Beautifully crafted objects made to be used in ceremonies and rituals going back hundreds of years are still made in similar ways today. Motifs and designs that have great symbolic significance in Native American culture and within its belief systems are used both traditionally and in a more contemporary context. Can you speak to this connection between object and culture in your own work and research? Jill Ahlberg Yohe: I try to understand these works of art in relation to the context in which they are made and the intentions of the artist who makes them. Rather than drawing solely from Western art historical perspectives, my aim is to understand the aesthetic principles and practices of the particular community the art comes from, and what they understand as great art, and who they consider to be great artists. This allows for such richer understanding. Douglas K. Limon: There is a strong tie between my art and my cultural beliefs. Whether the objects are made for ceremonies or everyday use, they are designed with personal, clan, or tribal designs. We live our culture on a daily basis, so we incorporate cultural motifs and designs in the creation of traditional objects as well as more contemporary work. I input cultural and spiritual messages in my designs. The visual appearance of the art form is one thing but there is meaning in the designs and colors that has to be interpreted. It has history. It has beliefs. I create my work to honor my ancestors. For better or for worse, Native American craft has bobbled between the labels of art, artifact, traditional, and innovative for hundreds of years. These often unavoidable labels contribute to potential challenges in both the practice and presentation of the craft. Can you speak to that challenge within your own experience? J.A.Y: One thing I try not to do is place judgments on ideas like, art, craft, artifact, and tradition. I get the feeling that people often place value on one of the terms and contrast it with another, i.e. art is "good" and artifact is "bad" or "not art." I think that it is important to understand that these terms themselves are products of particular historical developments and not cold hard truths. From this viewpoint, we can then perhaps more fully explore these ideas from many directions. D.K.L: I experience this when I enter contemporary art shows. There typically is not a category for my work. Some venues have a difficult time considering my work “fine art.” I believe these labels or mislabels stem from a misconception of the value of Native American Art and culture. This is due in part to United States history’s lack of respect for the contribution of Native American art, our culture, and Native Americans in general. How can a savage create a masterpiece? Another reason, despite the attempted genocide of Native Americans, we are still here living our culture and creating art. Our art is always evolving. We have a long legacy of creating magnificent art. We have been creating art since time immemorial. Themes of community seem to have a significant role in your work, can you talk a bit more on how that has played out in past projects and will continue to be explored in the future? J.A.Y: I once read something about Native American art that I thought was interesting. This person said that what separates Native American art from art of other communities is that in Native American art, there is not a separation between community and art. It is inseparable. I thought that was an interesting perspective. D.K.L: Community is very important. It’s a way of life, whether it’s coming together for a powwow to celebrate or to make a cradleboard for a new baby, everyone comes together to share for the greater good. I used this theme of community to create the Community Bandolier Bag. For this project community meant anyone in Minnesota could participate in beading on the Community Bandolier Bag. More than 400 people came together, Native, non-Native, young, old, male, and female. The entire Minnesota community was invited to come and “bead a part of history.” People had a chance to experience what it takes to create a traditional woodland art form and to learn more about our culture. Are there other artists, either locally or nationally, who are working in a similar contemporary, traditional style that you would recommend checking out? D.K.L: There are many. I will mention one here, Mel Losh. He is a master quill artist and bead artist. He’s from the Leech Lake Band of Ojibwe. Mel creates amazing quill work and he is on his 18th bandolier bag. His work is in museums and private collections around the world. A couple great sources to find more talented Native American artists creating Authentic Native American art are the Indian Arts and Crafts Association and the Indian Arts and Crafts Board. 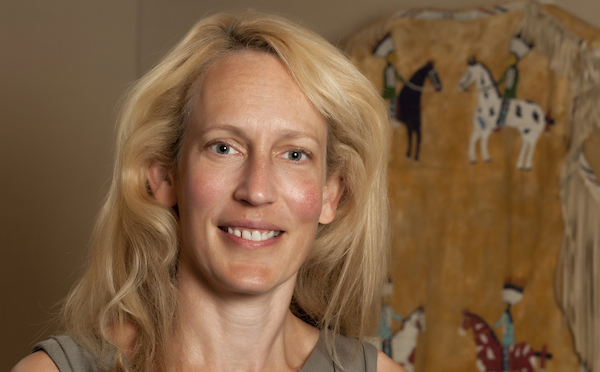 Jill Ahlberg Yohe, new Assistant Curator of Native American art at the Minneapolis Institute of Arts.